I was almost tempted to post this on DPI but I think its still in the conceptual stage of thought so I thought it would be best to share it on Thoughts instead. I was browsing through the work of Architectural Association as I was fascinated by their intricate graphic/ layout design. I came across one image which, in the AA website was not even that special. But it did make me reflect on what I was seeing. This is what architects might call a cross section. Its a 2D representation of ether the building they have designed or in broader scale, the area in which their design work will be situated. It is used through out the process of designing buildings as it reduces information to what is essential. What struck me about this image is that it has given different hierarchy and graphically separated them. In the background, there is a thin outline of the buildings around their proposal which contextualize their work. On the left, there is the main dome of the Vatican city. 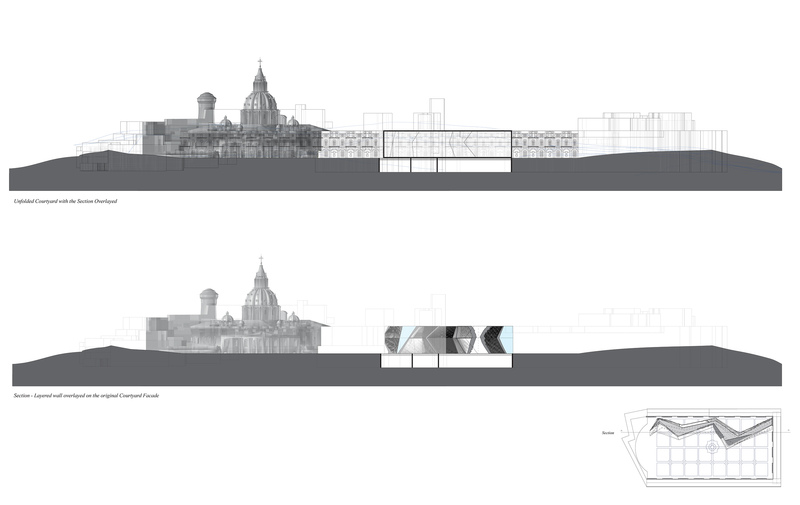 As their newly designed building interacts with the dome, it is represented in the image with powerful visual language. Finally, their proposal is outlined with a thick black line to intensify its presence. Furthermore, the lower cross-section describes the conceptual element of the building and colour is applied to intensify its message. So I would like to ask, what might Service Cross Section look like?